Looking to impress the guests of your next party? You've come to the right place. 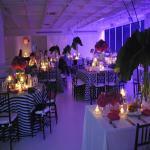 Eventup has the coolest homes in Los Angeles that will make your party unforgettable! Can't decide between a mansion or a yacht for your next bash? Have the best of both worlds and rent a mansion that looks a like a boat...seriously. The Bel Air Ship Estate is an 11,000 square foot home with amazing city views and state of the art architecture. Avoid sea sickness and book one of the most unique homes in all of Los Angeles. Frank Lloyd Wright, Jr. Mansion: An architectural masterpiece to say the least, the mansion's design mimics that of the ancient Mayan pyramids and includes ancient artifacts. Who wouldn't want to host a party with an enormous Indonesian Buddha? The home has also been the backdrop of various commercials, Martin Scorcese's Aviator, and a few episodes of America's Next Top Model. P.Diddy shot a music video here...need I say more? If he thought this home was worthy of a music video, then it'll definitely be cool enough for your next party. Between the ultra modern design and amazing pool with a cascading waterfall so beautiful the property was named for it, you are guaranteed to have the party of the year. Hollywood Castle: Why go to Medieval Times when you can rent out your own personal castle? That's right, in the heart of Los Angeles, you can host a party at a 10,000 square foot mansion with breathtaking city views and architecture that resembles a medieval castle, moat and all. Your chance to live out your rockstar fantasies is finally here. Located on its own private half-acre, The Rockstar Mansion could have easily been the location of that crazy party last friday night that Katy Perry won't stop singing about. And if you're just looking to host a quiet dinner party, this place has also has a Porche design professional kitchen. The Devoe House: This Hollywood Hills estate will take your breath away with the best views in the city. No need to provide entertainment, your guests will be awe-struck by the clear view of the Channel Islands from the estate! Aside from the incredible scenery, the property includes a sleek marble floors, a beautiful pool and plenty of space for you and your guests. If Marie Antoinette lived in the modern world, this would be her home. This Bel Air masterpiece is over the top (the front yard alone is bigger than most properties in the Los Angeles area). The home was designed with marble flooring throughout, a grand staircase, and a dining room table fit for a royal court. Step outside and you'll see a backyard so well manicured, it rivals the Huntington Gardens. Do you think these homes are cool enough for your next party? Or have you found an even more amazing one on our site? Let us know by leaving a comment below, or sharing on Facebook and Twitter.